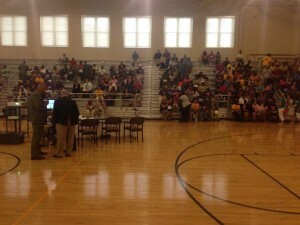 Community members pack the gym at Lincoln School back in July for a public meeting about the school's failing accountability scores. State officials toured the failing schools yesterday and say they see big improvement. Members of the State Board of Education’s Committee on School Turnaround traveled to Evansville yesterday to check on progress in two of the district’s failing schools, Lincoln School and Glenwood Leadership Academy. After touring the schools and meeting with district officials and its lead partner Mass Insight, committee members say they are impressed with the progress. In a media release sent out by the SBOE, board member Tony Walker said leadership within the district and students’ engagement impressed him. Both K-8 schools, though, have struggled to improve their academic performance amid almost universal student poverty. Higher teacher retention is one part of that strategy. At Lincoln, Darrett said about half of the school’s current teachers have changed within the last two years. But she told the visiting committee members that the tide is turning, and Lincoln’s teachers are working in unison to boost student achievement. Not only did the SBOE notice the improvement, Mass Insight officials say working with the district has gone smoothly. Not all turnaround efforts and partnerships are not as successful as this one. As we’ve reported, a turnaround partnership in Indianapolis between Arlington High School and Tindley Accelerated Schools has been shaky, thus stalling turnaround efforts. But for now, those involved in the Evansville schools are pleased with the progress. Currently, Glenwood Leadership Academy is already under SBOE intervention. A-F grades for this year are not released, but if Lincoln receives its sixth “F” in as many years, they could also be placed under intervention.